If you haven't picked up a box of awesome for your dog, I highly recommend it. Surprise Pawty showed up today and I'm thrilled with the contents. So are the boys! 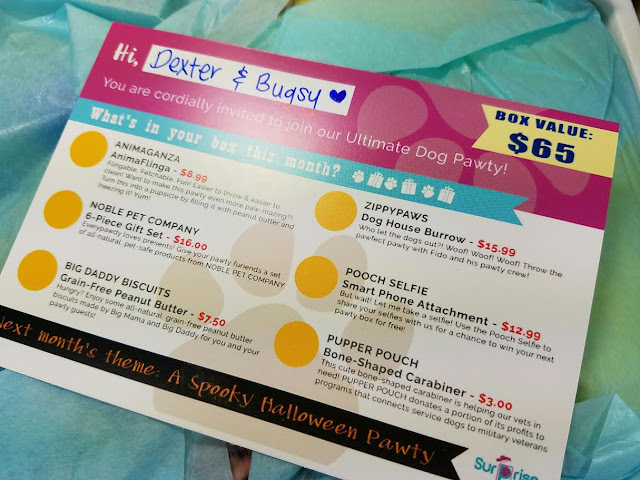 This is a brand new subscription box for dogs and if their first box is anything to go by, it's going to be a great one. Surprise Pawty really wants to send you things your dog will love. When you go through the checkout process you'll be asked for details about your pups. In the Additional Notes section, you should write in about allergies, play habits, favorite kinds of toys, etc. That way, your box can be curated just for you. This review is for the Small Dog box. 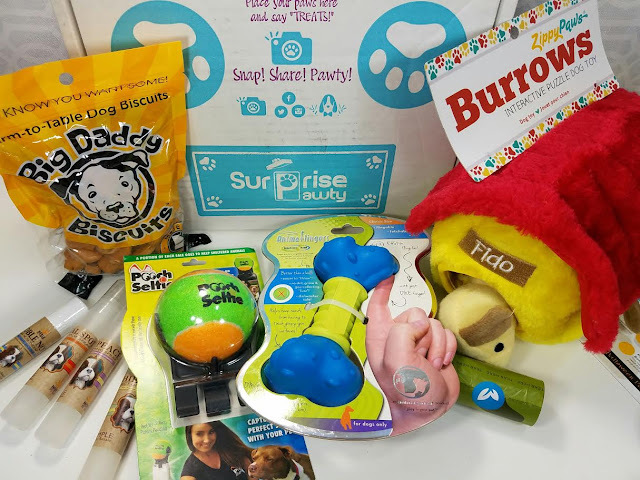 If you're looking for a subscription which will send high quality toys and organic treats, you will definitely want to check this box out. No matter what size dog you have. Surprise Pawty even has boxes for tiny dogs under 10lbs. Those can be hard to find! What You Get: You'll receive 5-6 premium items including natural, healthy, organic treats and safe, durable, interactive toys. Also included will be accessories and essentials to help you care for your dogs. 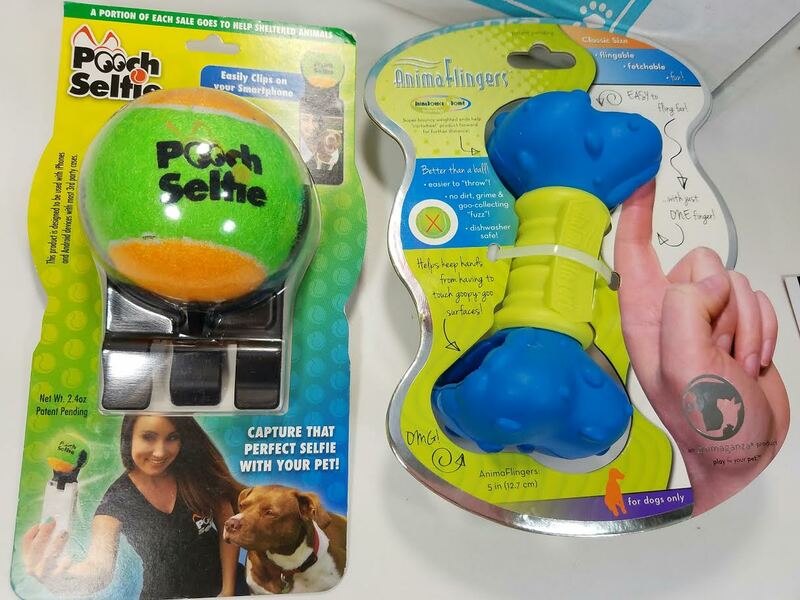 Pooch Selfie Stick- My husband had actually sent me a link to one of these awhile ago and I just laughed. Actually getting it meant I had to try it out. It only works on Bugsy because he loves balls. Maybe if I squeeze a treat on there, too, Dexter would also look the right direction. Animaganza AnimaFlinga- This is a rubber toy with finger holes that help you fling it. I might take the other idea and fill the holes with peanut butter and freeze it. This is a pretty heavy toy so I think it'd be a little tough for Bugsy to fetch. And I'd feel bad if it accidentally hit him. Peanut butter is more Dexter's style so I'll use this with him. Noble Pet Company 6 Piece Gift Set- I have never seen anything like this for pets! 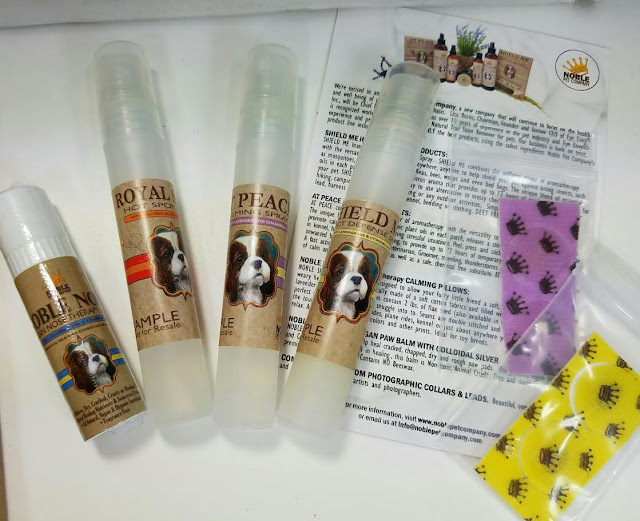 These are sprays for keeping your dog calm, deter bugs and soothe hot spots. Besides the sprays there are some patches that you can pop onto your dogs collar and get the calming results. So interesting and I'm definitely going to be trying this. Big Daddy Biscuits Grain-Free Peanut Butter- I don't know any dogs that don't like peanut butter. 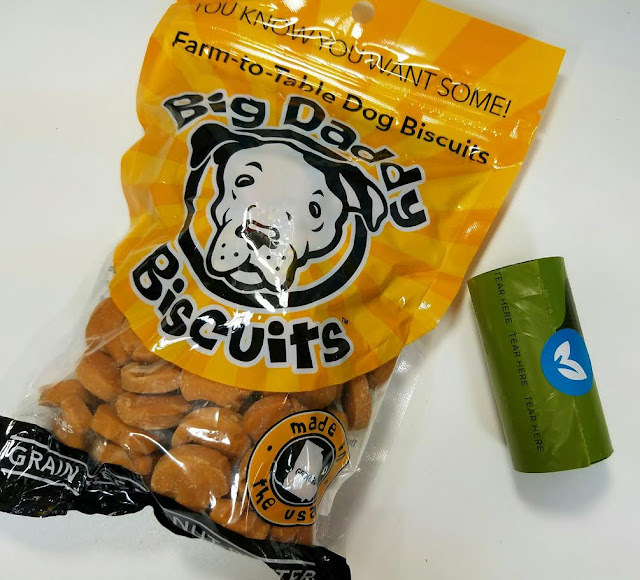 These treats are made in Atlanta, Georgia using natural and organic ingredients, sourced locally whenever possible. I will happily treat my boys to these biscuits! Poop Bags- I don't actually use poop bags. We have a portion of the yard sectioned off for the dogs that they have all day access to. Maybe I'm a bad dog mom but I don't take them for walks. They get plenty of exercise chasing each other around. With that said, we are moving to Colorado which is apparently a very dog friendly place so we may have to start taking walks with them to help make new friends. 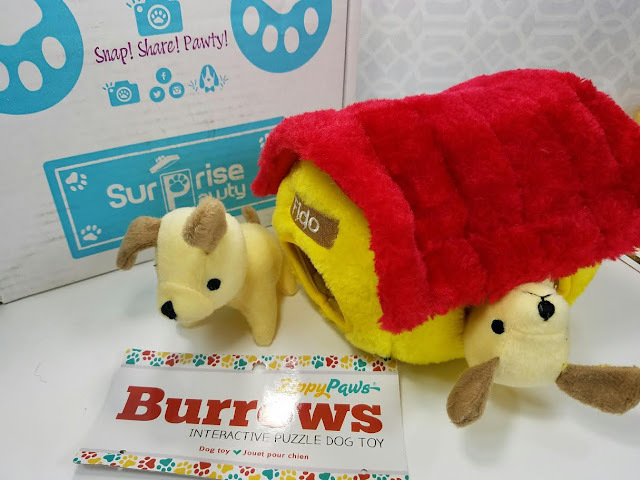 ZippyPaws Dog House Burrow- Okay, this toy made this box. It was already awesome before I got to this one but this was the BIGGEST hit!! Bugsy has gone nuts for his puppies. Last night, he brought them to bed with him. This morning, he jerked awake and shot out of bed to find the ones that had fallen on the floor. It was hilarious! 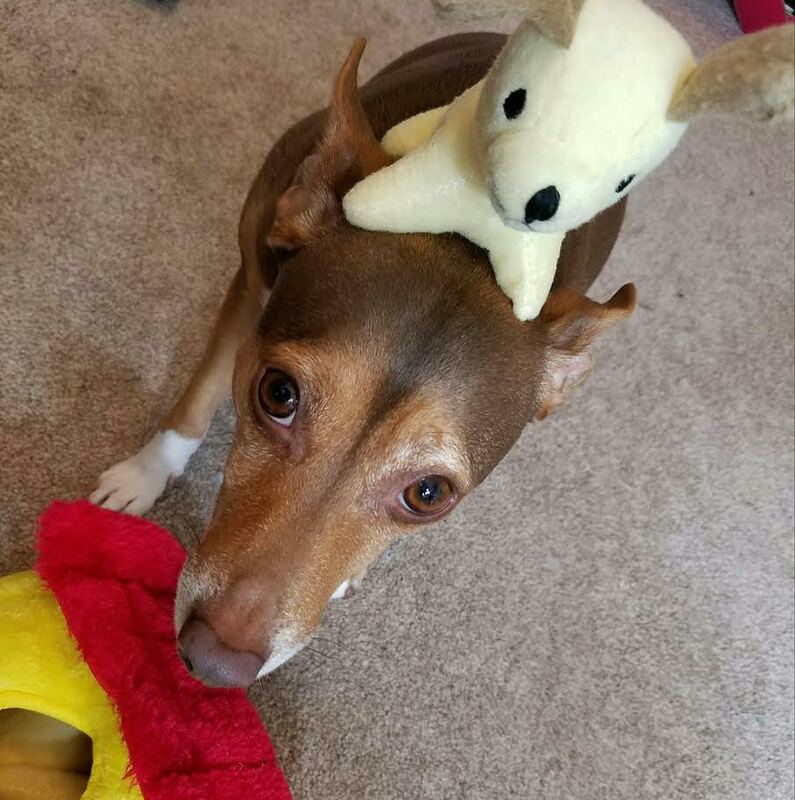 Only one still has a squeaker that squeaks but they're all still intact otherwise. VERDICT: I am very impressed with the quality of the toys and treats included in Surprise Pawty. It really does make a difference when it comes to toy longevity. I don't expect a toy to be completely indestructible (I do have rat terriers) but a good quality one generally lasts longer. I also think it's fantastic the treats are organic. 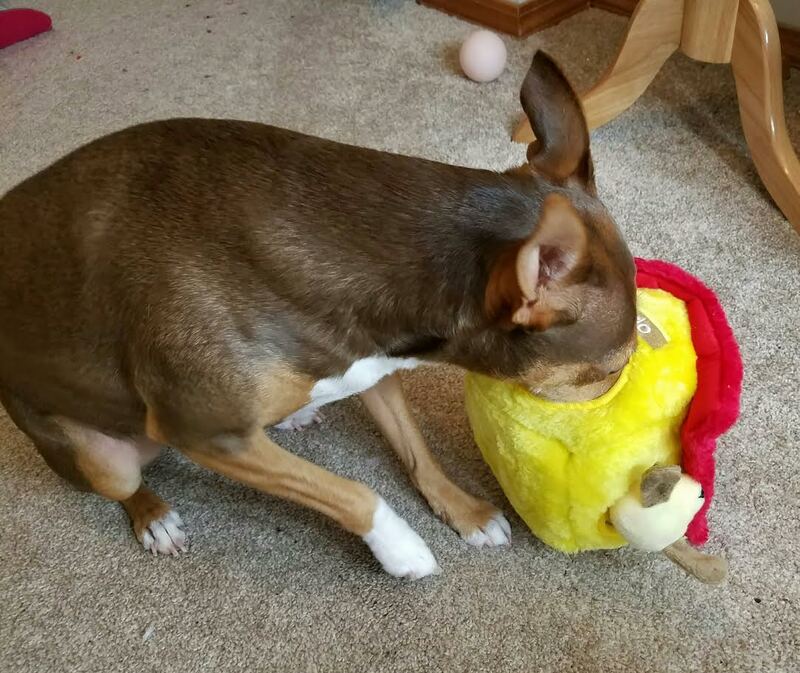 This box is a little more expensive than Barkbox but based on this first one, I think that it's worth it to get the better quality toys. Plus boutique treats are always a welcome addition in any box. I'm curious to see what other brands pop up as the months go by. 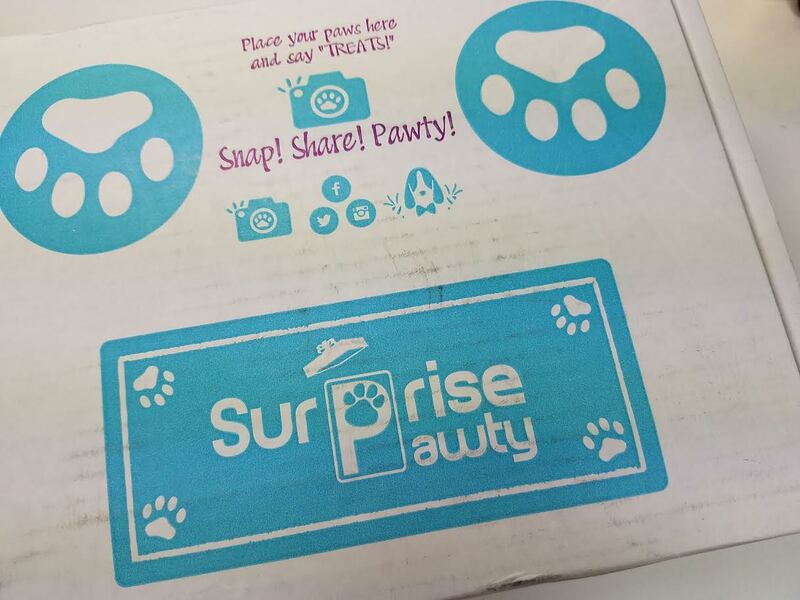 If you would like to subscribe to Surprise Pawty, you can do that here. Use code BITSBOXES for 15% off ANY plan! You'll save $54 off a one year subscription which makes each box just $30! What are your main criteria for subscribing to a box for your pets? There aren't a lot out there that promise organic treats like this. *This box was sent complimentary for review purposes. All opinions are my own.